Races two and three of the Royal Hong Kong Yacht Club organised IP Global Autumn Regatta on Sunday Sept 29 were run under good sailing conditions and produced excellent competition. This was in contrast to Race-1, held on Saturday Sept 28, when very light winds were not very conducive to exciting sailing. Victoria Harbour was blanketed in haze on both days, but the stronger breeze on Sunday did improve the atmosphere to some extent. A total of 95 boats took part in the regatta, split across 14 classes with some boats competing in both Big Boat (IRC) and HKPN classes. The Victoria Harbour courses set by Race Officer Sofia Mascia started at Hung Hom and extended to Tai Koo Shing and Shau Kei Wan with the finish line set west of Dock Buoy. On Sunday wind gusts were up to 17 kts and eight Ruffian class boats were blown on course side at the start (OCS) and all but one did not re-cross the start line so lost points. Several of the Big Boat 1 competitors Signal 8 and Sell Side Dream missed the finish line at the end of Race-2 by going the wrong side of Committee Boat Kellett VI. 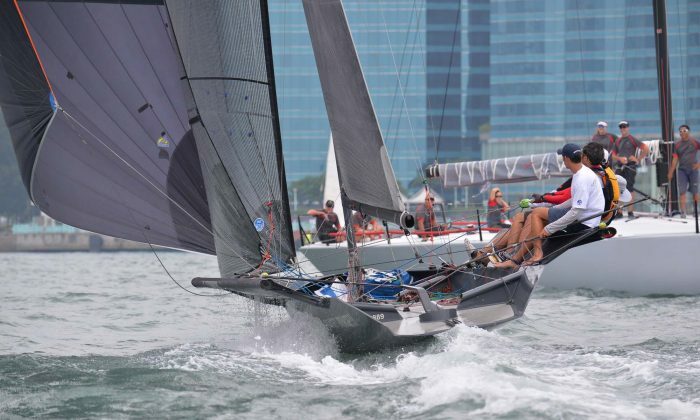 RHKYC is devoted to purist Class Racing with separate starts for each main class of boat. In this case, 10 starts were conducted requiring 45 minutes to start all boats. Some classes are quite small in number so the start spectacle is often not high and boats tend to be rather spread out, but with so many boats starting at different times is was difficult for observers to keep track of the boats. Jelik won Big Boat-1 ahead of KuKuKERchu with FreeFire coming third. Signal 8 and Sell Side Dream had disappointing regatta, with both missing the finish line in Race-2 and Signal 8 retiring from Race 3. Ambush did well to finish first in Race-3. All eight boats competed well in Big Boat-2 but the top three were Whiskey Jack, Talkinghead and Rampage. Calamansi with three straight wins sealed the Big Boat-3 prize with Elites 99 second and Goddess third. Mei Fei took top honours in the Dragon class with Kamloong second and Eaux Vives third, while Tipsy Tiger, Shrub and No Name were the top boats in the Etchells class. Tchaikoffsky took the Flying Fifteens title followed by Lighthouse and Puff’n Stuff. Footloose, Sea Biscuit and Figure of Eight headed the J80 class and Merlin with a 1-2-1 finish headed the Sports Boats with Red Herring second and Brace Brace Brace third. Brace Brace Brace won Race-2 and came second in Race-3, but did not compete in Race-1. Impala I, finished ahead of Rainbow Warrior and Taxi in the Impala class. Solstice triumphed in the Pandora class and Scallywag, Schannuleke and Miss Piggy headed the Ruffian classes. There are some exciting racing events coming in the next few weeks. The China Coast Regatta takes place South of Hong Kong Island from Oct 12-14 and the Hong Kong to Vietnam race starting on Oct 17.